Facebook always had ability to categorize and organize friends in separate lists. However, the implementation of the List feature was crude from the start and many users did not bother to create any Friend List of Facebook. With Google+ Plus’s Circles feature showing how easy one can organize friends, Facebook has gone one step further with automatic creation of Smart Friend Lists which can be customized further by a Facebook user. Facebook will automatically update your profile and start showing pre-created Friends Lists in your account. Friends contained in each list are automatically decided by Facebook based on your interaction activity and matching profile information of your friends. 1. Basic Friend Lists – It includes 3 types of lists: Close friends, Acquaintances and Restricted. 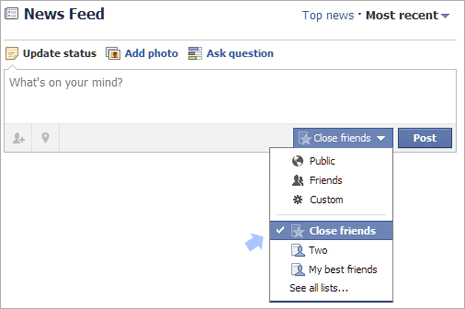 Close friends has your best friends, who should show up more in News Feed. Acquaintances list friends who should show up less in News Feed. Restricted contain friends who can only see posts and profile info you make public. 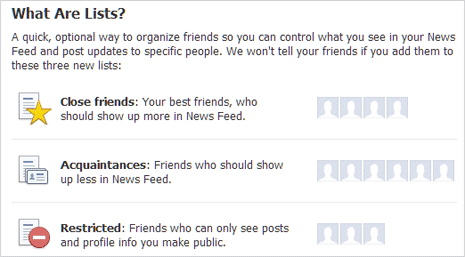 Best part: Facebook won’t tell your friends if you add them to these three new lists. 2. Smart Friend Lists – It includes custom lists based on your activity and profile information. Lists are created with specific friends related to: Work, School, Family and City. For example: all friends working in your company will be listed automatically specific ‘Work’ list. Similarly, friend lists are also created for common school, city and so on. You can also add and remove friends from any pre-created smart friend list. 3. Existing old Lists – If you had created friend lists on Facebook using old method, those are also displayed in Friend List section. You may delete them or edit them further by adding or removing friends from the same. On the face, pre-created Friend lists can overwhelm few Facebook users. Infact, this is more convenient implementation – as many of us are lazy enough to get started with Friend Lists creation. Now you do not have create lists (as they are already created) and you only have to do the editing part. 1. After Facebook login, look for Lists option on left sidebar of Facebook profile. Click Lists and you should see all pre-created and previously created Friend Lists contained in your profile. 2. Click any Friend List name to view friends listed in them. To add Facebook friends in specific list, click Add Friends and you are good to go. 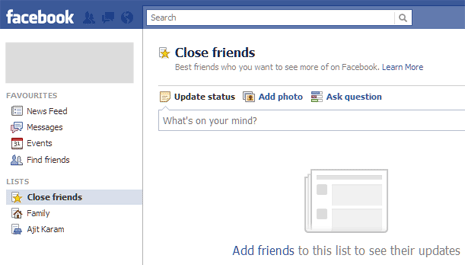 Similarly you can browse, add friends, remove friends from various friend lists as per your choice. Real implementation of Friend Lists comes while posting updates. At times you only want to share a personal update with only close friends. So while posting update, select Close Friend List below the Update Status box. This specific update will only appear to friends listed in Close Friend List. Easy and organized, isn’t it?